The Congregation of Mary Immaculate Queen (also known as CMRI and the Fatima Crusaders) is a self-professed Catholic and validly ordained priestly society originating in the United States, founded in 1967. It offers the Tridentine Mass and claims to preach the traditional Catholic faith, rejecting the Second Vatican Council and upholds a right and true sedevacantist position in regards to the Vatican II sect claimants to the Papacy, since the Vatican II sect is totally apostate. Their headquarters is at Mount Saint Michael in Spokane, Washington. Under their founder Bishop Francis Schuckardt, the organisation was somewhat controversial because of the erratic behaviour of this figure and the fact that he illicitly received his orders from the schismatical apostolic line of the Old Catholic Church (Jansenists); though the CMRI has always claimed to espouse the traditional Catholic faith. The present Superior General, Bishop Mark Pivarunas, derives his apostolic lineage through the line of the heretical Bishop Ngo Dinh Thuc, “Archbishop” of Huế in Vietnam (he attended the robber’s Second Vatican Council (1964) and signed its documents and there is no record of him ever recanting or abjuring from his heresies, and by that fact alone, he was known to be a notorious heretic who is not Catholic and holds no office in the Church). This means that even if Mark Pivarunas was Catholic (which he is not), his consecration by Thuc would still not only be considered illegal, but also schismatical if he knew that Bishop Thuc was a heretic or schismatic. By decreeing “in no way could that be allowed,” the Holy Office confirmed that it is a matter of faith that a Catholic may never knowingly be ordained a priest or consecrated a bishop by a heretic or schismatic. The Holy Office condemns the same excuse that some Thucites use for going to the notorious apostate and heretic Bishop Thuc to be consecrated bishops or ordained priests. They say there are no Catholic bishops; therefore, we can go before a non-Catholic bishop to be consecrated or ordained, but Canon Law condemns this as we have seen. The 1917 Code of Canon Law, Canon 2372, also condemns them by reaffirming the Holy Office’s 1709 decree. All those consecrated by Bishop Thuc or by others of his line (or by any other heretic or schismatic) cannot exercise their orders lawfully since they (in addition to being heretics and outside the Church) lack the canonical mission which the Council of Trent dogmatically teaches to be necessary for a bishop to be a legitimate minister of the word and the sacraments: “If anyone say… that those who have not been rightly ordained by ecclesiastical and canonical power and have not been sent [by the Church], but come from some other source [such as a heretical or schismatical source], are lawful ministers of the word and of the sacraments: let him be anathema.” (Council of Trent, Session XXIII, Canon VII; Denzinger 967). Plainly no necessity, no claim of epikeia can override, even in an extreme need, an obligation derived, not from human law, but from Divine law infallibly proposed as such by the Church (such as the Divine Law that forbids Catholics to communicate in the sacraments with non-Catholics and heretics). Mark Pivarunas was later consecrated as a bishop by Bishop Moisés Carmona of Mexico in 1991. At present the Congregation of Mary Immaculate Queen serves 29 churches and chapels in the United States, Canada, Australia and New Zealand. The organisation is growing and now has centres in Europe, Argentina, Brazil and Mexico. It also operates the Mater Dei Seminary in Omaha, Nebraska, while the nuns attached to the congregation have a convent at Spokane. If illegal bishops and priests, such as the Thucites, want to enter the Catholic Church and have their sins forgiven, they must abjure by renouncing their schismatic crime and any heresies they believe in, along with the public crimes of schism and heresy of the non-Catholic bishop who consecrated or ordained them. Many traditional Catholics are familiar with the priests of the CMRI. For those who are not, the CMRI is a society of priests which professes to be Roman Catholic, ordains men validly according to the traditional Roman Rite, rejects the New Mass, the Vatican II sect and the Vatican II antipopes. The CMRI has done many good things in favor of tradition and against the Vatican II Counter Church, and for those things it deserves credit. However, we have pointed out in our newsletters and magazines the unfortunate yet undeniable fact that the priests of the CMRI hold to heresy (as will be shown below). The priests of the CMRI hold to heresy first and foremost for their obstinate denial of the solemnly defined dogma that the Catholic Faith is necessary for salvation. The CMRI holds that non-Catholics can be saved without the Catholic Faith. Such a position is heresy. I ask those supporters of the CMRI who are unfamiliar with the CMRI’s belief in this regard not to dismiss this as something you simply cannot accept (because the Catholic Church condemns you if you do). Please consider the points below. Since the CMRI priests reject a Catholic dogma, no one aware of this fact (which will be proven below) can support them, be in religious communion with them or receive the sacraments from them under pain of mortal sin. Those who continue to do so obstinately will partake in their mortal sins against the faith and will follow them to damnation. Because any obstinate adult practitioner of a false sect or religion is serving the Devil and not the true God, being the child of this Devil, any practice of his false religion or sect is a partaking “of the table of the devils.” This means the religious ceremonies and prayers of a false sect or religion. Our Almighty Creator is appalled when His children soil themselves with the filth of false religions or non-Catholic sects. So while it is wrong to be at the ceremonies and prayers of a false religion because it misleads non-Catholics and scandalizes Catholics, more than anything by far is it gravely sinful because it betrays God Himself. God commands all men to worship in His Religion of Catholicism, and He is exceedingly angry when people violate this most important of His commandments. 1. The CMRI twice published in their Quarterly Magazine an article entitled, “The Salvation of Those Outside the Church.” It was published in the Winter 1992 issue of The Reign of Mary, The CMRI’s publication (Vol. XXIV, No. 70, p. 10.). This heresy was so blatant that I called the headquarters of the CMRI in Washington and spoke to one of the priests about the article. He told me that he had “no problem with it.” They hold to this heresy because they adhere to Protocol 122/49, the heretical letter also called Suprema haec sacra which was published in 1949 against Fr. Leonard Feeney. This heretical, non-infallible letter teaches salvation by “implicit” baptism of desire, including for those in “invincible ignorance,” and for those who are not “members” of the Church, and for those “who do not belong to the body of the Catholic Church.” In other words, it teaches that there is salvation for some people who don’t have the Catholic Faith or believe in Jesus Christ. This is blatantly heretical. Its teachings are utterly refuted by Catholic dogma, as proven in the section at the end of this article. The CMRI recently published a pamphlet defending “baptism of desire” which implements arguments which have all been thoroughly refuted. They use a combination of fallible texts (which don’t prove the point), misunderstood texts (which don’t state what they claim) and mistranslated texts to inculcate their false position. In fact, they outrageously still use the “except through” mistranslation of Sess. 6, Chap. 4 of Trent that has been discussed in this article. They also don’t tell you in their easily refuted and dishonest pamphlet that they hold that it’s possible for Jews, Muslims, Buddhists, etc. to be united to the Church and saved. 2. In the Winter of 1996, The Reign of Mary (publication of the CMRI) Vol. XXVI, No. 83, pp. 4-5, featured another heretical article called “The Boston Snare,” by Bishop Robert McKenna. Like the CMRI, Bishop Mckenna believes that members of all kinds of non-Catholic religions can be saved. He says that the dogma Outside the Church There is No Salvation only applies to those “knowingly” outside the Church, which is a heretical idea. Frankly, this has to be one of the more heretical statements made by a person purporting to be a traditional Catholic bishop. As can be seen clearly from these words, Bishop McKenna (like almost every modern priest) rejects the true meaning of this dogma and holds that non-Catholics can be saved without the Catholic Faith. In a desperate attempt to defend his heretical version of Outside the Church there is no salvation, McKenna admittedly must change the understanding of the dogmatic formula proclaimed by the popes. He tells us that the “true” meaning of the dogma is that only those who are “knowingly” outside the Church cannot be saved. Oh really? Where was that qualification ever mentioned in the dogmatic definitions on this topic? Nowhere! Recognizing that such an understanding runs contrary to the clear words of the dogmatic definitions on the topic – none of which ever mentioned “knowingly” and all of which eliminated all exceptions – Bishop McKenna attempts to explain away the problem. The dogma Outside the Church there is no salvation, according to Mckenna and the heretical CMRI which printed this article in their magazine (Vol. XXIV, No. 83) because they believe the same thing, is not a truth from Heaven, but a warning or admonition written for non-Catholics! This is grotesque theological nonsense and flat out heresy. As we have already seen, dogmas are truths fallen from Heaven which cannot possibly contain error. They are not merely human statements written to warn non-Catholics, which are subject to correction and qualification. Dogmas are infallible definitions of the truth which can never be changed or corrected, and have no need to be changed or corrected since they cannot possibly contain error. Dogmas are defined so that Catholics must know what they must believe as true from divine revelation without any possibility of error, which is exactly the opposite of what McKenna and the CMRI assert. McKenna and the CMRI are compelled to deny that dogmas are truths from Heaven and to belittle dogmas to fallible “warnings for non-Catholics” which can be corrected, because they desire to justify their heretical belief in salvation outside the Church – i.e., those “unknowingly” outside the Catholic Church – which belief, as they unwittingly admit by employing such argumentation, is directly contrary to the clear words of the dogmatic definitions. This is perhaps what is most important about the heresy of Bishop Mckenna and the CMRI: the dogma deniers – that is, those who believe in the heresy that “baptism of desire” and “invincible ignorance” can save those who die as non-Catholics (such as Bishop McKenna and the CMRI and almost every modern priest whether he is “traditional” or Novus Ordo) – are revealing by such ridiculous argumentation that their “version” of this dogma is incompatible with the words of the dogmatic definitions; for if their version were compatible with the dogmatic definitions they would never be forced into heretical statements such as those above. The CMRI has printed other heretical articles on this issue, but it is a demonstrable fact, easily ascertained by just asking any of their priests, that they adhere to the heretical Protocol 122/49 and believe that invincible ignorance can save members of false non-Catholic religions and persons who don’t believe in Christ. This heresy is held by almost all priests today. 3. A priest from the CMRI’s seminary in Nebraska and a nun from the CMRI convent in Washington told me (when I questioned them over the telephone) that non-Catholics who die in their false religions can be saved without the Catholic faith. This has been the response of every priest of the CMRI that I have questioned about this issue. While they admit that they believe that non-Catholics can be saved without the Catholic faith, and while they admit that they have no problem with articles which deny Outside the Church there is no salvation word for word, the priests of the CMRI will also claim that they do hold the dogma Outside the Church there is no salvation! Therefore, the priests of the CMRI are heretical liars: they claim to hold Outside the Church there is no salvation while they print articles denying it word for word and while they tell anyone who asks them the appropriate questions that non-Catholics can be saved without the Catholic Faith! Notice that the SSPV writer “simply refuse to believe” in the Church’s dogma that all who die as non-Catholics are lost. This is the SSPV’s public teaching (and all of these heretical priestly societies teaches their heresies publicly). Those who refuse to believe in the dogma Outside the Church There is No Salvation until they understand how there is justice in it are simply withholding their Faith in Christ’s revelation. Those with the true Faith in Christ (and His Church) accept His teaching first and understand the truth in it (i.e., why it is true) second. A Catholic does not withhold his belief in Christ’s revelation until he can understand it. That is the mentality of a faithless heretic who possesses insufferable pride. St. Anselm sums up the true Catholic outlook on this point. The CMRI is in heresy, therefore, against the above infallible teaching of the Catholic Church, in addition to many other statements from the Magisterium. For those who find it hard to believe that the priests of the CMRI could be this heretical and dishonest, do not be surprised at all. Basically every single heretic who denies the dogma Outside the Church there is no salvation will tell you that he is not denying it. The heretics who believe in salvation outside the Catholic Church know that the Catholic Church teaches that there is no salvation outside the Church, so they cannot always come right out and blatantly deny it (although the CMRI even did that in the article they printed). The heretics who deny this dogma don’t primarily reject it in name but in its meaning. The only meaning of the dogma Outside the Church there is no salvation is that which holy Mother Church “has once declared” in Her definitions. That meaning is that all who die without the Catholic Faith or outside the Church or in a non-Catholic religion cannot be saved. The CMRI totally rejects this meaning, as does almost every modern day priest. Their meaning or “version” of this dogma is not what the Church says it is; in fact, it is the opposite. Their “version” of Outside the Church there is no salvation is that members of non-Catholic religions can be saved without the Catholic faith in their false religions! 4. Recently, someone we know was attending a Confirmation class at the CMRI’s chapel in Santa Clarita, CA. The teacher of the class, a layman, publicly stated that Jews can be saved without the Catholic Faith. The person who heard this heresy subsequently went to the CMRI priest in charge of the chapel in Santa Clarita, Fr. Dominic Radecki. The person asked Fr. Radecki what he had to say about this horrible heresy that had been uttered at his chapel, that Jews can be saved without being Catholic. Fr. Radecki not only did not rebuke the layman who had stated that Jews can be saved without the Catholic faith, but he defended the layman’s heresy (that Jews can be saved without the Catholic faith) – thus proving what has been stated all along: that the CMRI priests reject the dogma Outside the Church there is no salvation and are not Catholics. 5. The CMRI’s heretical denial of the dogma Outside the Church there is no salvation is no more effectively illustrated than in the book Fundamentals of Catholic Dogma by Dr. Ludwig Ott. The CMRI advertises for and sells the book Fundamentals of Catholic Dogma by Dr. Ludwig Ott (at least as of 9/24/03); and the position of Dr. Ott on the dogma Outside the Church there is no salvation corresponds exactly to that of the priests and nuns of the CMRI. Here on page 311 Dr. Ott correctly tells us that it is the unanimous teaching of the Fathers (not to mention the solemn teaching of the Magisterium) that salvation cannot be achieved outside the Church. But watch this. On the page immediately before this (page 310! ), Ott tells us word for word the opposite! “But let your speech be yea, yea: no, no: and that which is over and above these, is of evil” (Mt. 5:37). From one page to the next, Ludwig Ott contradicts himself on whether those who are outside the Catholic Church can achieve salvation! He even uses the exact same verb – “achieve” – in both sentences, but with the opposite meaning from one to the next: 1) “salvation cannot be achieved outside the Church”; 2) those “outside the Church can achieve salvation.” He uses the exact same verb to mean the exact opposite thing from what he stated on the page just before! His speech is not of God, but sadly of the devil. Black is white and white is black; truth is error and error is truth. And this is exactly the heretical position of the CMRI. But for the pre-Vatican II heretics who obstinately condemned the priest Father Leonard Feeney who rightly defended this dogma of the Faith, obstinately despised the dogma Outside the Catholic Church there is no salvation and sowed the seeds for the Great Apostasy that is now upon us, it is no problem believing that there is salvation outside the Catholic Church, while simultaneously pretending to believe that there is no salvation outside the Catholic Church. It is no problem for these people because they are of evil (Mt. 5:37). The “priests”, ecclesiastics and adherents of the Vatican II sect, as well as the priests and followers of the SSPX, SSPV, CMRI and all other independent, validly ordained traditional “Catholic” priests in this great apostasy (and those who knowing this information persist in denying this infallible dogma), as well as those who obstinately support or agree with the heretical groups, societies or sects, or the heresy advanced by these heretics, should rightly fear, as Pope Gregory XVI says, because they will without a doubt inherit a place in Hell for obstinately denying a Catholic dogma if they do not repent and convert. 6. The CMRI and its heretical leader, Bishop Mark Pivarunas, are also adamant defenders of birth control by means of Natural Family Planning. The CMRI priests instruct people that Natural Family Planning is an acceptable form of birth control (see Natural Family Planning is Sinful Birth Control). Bishop Pivarunas also publicly defended this sinful birth control practice at one of their conferences. Most recently, in the Winter of 2003, the CMRI carried an article entitled “On the Question of Natural Family Planning,” again promoting that couples can limit the size of their family by means of the Natural Family Planning birth control method. Natural Family Planning is a sinful method of birth control which subordinates the primary purpose of marriage (the procreation and education of children) to secondary ends, by a deliberate attempt to phase new life out of existence by means of the rhythm method. Pope Pius XI adds teaches in Casti Connubii that the “sacredness of marriage which is intimately connected with religion and all that is holy, arises… from its purpose which is the begetting and education of children for God” and that all “Christian parents must also understand that they are destined… to propagate and preserve the human race on earth”. Our Lord Jesus Christ in the New Testament of the Bible also connects the will to bear children to salvation, teaching that a woman: “shall be saved through child-bearing; if she continue in faith, and love, and sanctification, with sobriety.” (1 Timothy 2:15) The Holy Fathers of the Church all agree with the Holy Scriptures and the Magisterium of the Church in this regard. 7. The CMRI has been sedevacantist (that is, they correctly hold that the Chair of Peter is vacant and that Benedict XVI is not the pope) for a long time; yet, they still administer Holy Communion to persons who reject the sedevacantist position. And according to various persons who have attended their Masses for years, the CMRI priests say little to nothing about the issue that Benedict XVI is not the pope from the pulpit. Therefore, while the CMRI’s publication states that their priests do not hold that Benedict XVI is the pope, this belief is not enforced at their chapels. Hence, as far as many people who are unaware of these issues and attending their chapels are concerned, the CMRI does hold that Benedict XVI is the pope, since they say little to nothing about it and do not require adherence to the dogmatic truths surrounding this issue (namely, that a person who says we shouldn’t convert non-Catholics is outside the Church). They also allow non-sedevacantist nuns to join their society and receive sacraments from them as their sisters in Christ. As stated, sedevacantism is the theological position held by traditional Catholics who recognize the Novus Ordo Church as a non-Catholic modernist religion, officially brought into being at the Second Vatican Council (1962–1965) and the leaders of that sect to be Antipopes, leaving the seat of St. Peter (who is regarded by Catholics as the first Bishop of Rome) vacant at the present time. Most proponents of the position regard the current antipapacy to have been in place since 1958 until the present time (there have been others in history). There have been 260 valid popes in Catholic history, and more than 40 antipopes (i.e., men who posed as popes but had not been truly elected). There have been more than 200 papal vacancies (periods without a pope). Sedevacantist should be applied only to those who believe that there is at present no reigning pope, but it is frequently used to include groups, known as conclavists, who have attempted to elect popes (or antipopes) of their own. By definition, sedevacantists oppose conclavism. 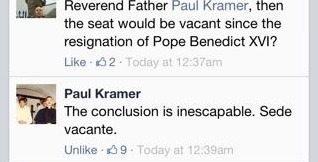 The word sedevacantism is derived from the Latin phrase sede vacante, which means "seat vacant," or "with the see (chair) being vacant" and is used in Vatican documents in the interval between the death or abdication of a pope and the election of a successor. A sede vacante period occurs between the death or resignation of a Pope and the election of his successor, when the See of Peter is vacant, and is called the Interregnum. This Latin term means between the reign (of one Pope and another). It is a period governed by papal law, which admits of no changes to Church governance, or to the spiritual or material patrimony of St. Peter, save the election of his successor. Hence, while the CMRI claim in their publications to be free from the errors and heresies which necessarily arise from obstinate adherence to the Vatican II Counter Church, if they don’t preach about this publicly at their chapels, they are – in reality – a group which accepts Benedict XVI; for they tolerate that heretical position at their chapel and give Holy Communion to persons who have rejected the information demonstrating that Benedict XVI is not the pope. For these of these reasons mentioned above, no one aware of this information can support the CMRI, be in religious communion with them or receive the sacraments from them in any way under pain of grave sin and denying the Catholic Faith. When Vatican II teaches that Jews, despite not belonging to the Church, are not to be considered as rejected by God, that means they remain in a valid covenant with God and can be saved. That’s also how the apostates in the Vatican II sect understood and implemented Nostra Aetate. Francis’ heresy on the Old Covenant is simply a reiteration of the doctrine of Nostra Aetate and the statements of the previous antipopes. It is also a further formalization of that heresy as the official doctrine of the Counter Church, for Francis teaches it openly in an Apostolic Exhortation addressed to the entire Church. Further, in his Apostolic Exhortation, “Evangelii Gaudium,” Francis professes that it’s admirable for Muslims to participate in daily Islamic prayers and religious services (252). He professes that non-Christians are justified by the grace of God (254), directly contrary to the Catholic profession of faith and Catholic dogma that only Christians, that is, those with the catholic faith can be justified. And, (254) of that document, Francis also speaks of non-Christian rites, signs and expressions, in other words, the false beliefs and wicked practices of non-Christian and pagan religions, as “God’s working” and things which “the Holy Spirit raises up.” And in his encyclical “Evangelii Gaudium” (255), Francis also professes that Religious Freedom, whereby everyone has the right to promote any religious view in public, is to be viewed a fundamental human right: “the importance of respect for religious freedom, viewed as a fundamental human right. This includes “the freedom to choose the religion which one judges to be true and to manifest one’s beliefs in public” (Evangelii Gaudium, # 255). Some time ago Mark Pivarunas of the CMRI stated that people who deny ‘baptism of desire’ aren’t ‘competent’ to deal with the issue. Referring to members of Most Holy Family Monastery and to their correct understanding on the issue, he also said they are ‘false prophets’ and used by the Devil (which is true in the sense that they lead people back to the jaws of the heretics and their sacrilegious, blasphemous communion; see above link). Mark considers it diabolical and soul-destroying to maintain that no one enters Heaven without being reborn of water and the Spirit. In support of his position, he cited the teaching of St. Alphonsus on ‘baptism of desire’ as if it’s definitive and ends the debate. Pivarunas apparently thinks that St. Alphonsus’ explanation of ‘baptism of blowing’ (baptismus flaminis) supports his view. In making that statement and argument, Pivarunas not only demonstrates his complete lack of familiarity with the details of this issue, but he embarrasses himself. The CMRI, its priests and leader, Mark Pivarunas, holds that souls can be saved in false religions, even in religions that does not desire baptism, including in Judaism, Islam, Buddhism, etc, as this conversation with another heretical CMRI priest proves: CMRI priest confirms their belief in salvation for non-Catholics (video). The priest confirmed what’s been mentioned and proven many times: the CMRI (like other groups which support ‘baptism of desire’) holds that souls can be saved in false religions. They believe ‘invincible ignorance’ can save anyone in any situation. They deny the defined Catholic dogma that one must have the ‘Catholic faith’ (which involves belief in the Trinity and Incarnation) to be saved. They are heretics who don’t possess an ounce of faith in Christ or His truth. Also, as the aforementioned conversation showed, the priest of the CMRI was not even familiar with the teaching of the Council of Florence. That’s another example of how Pivarunas and his group doesn’t understand Catholic teaching. First, Mark Pivarunas, as the leader of the CMRI sect and editor in chief of their heretical magazine, The Reign of Mary, doesn’t even believe in what he writes. For it is a fact that his own sect publishes official and formal newsletters denying this exact dogma on No Salvation Outside the Church. All of the CRMI priests and religious I have asked this question has said that non-Catholics who die in their false religions can be saved without the Catholic faith, and many of them even openly and publicly teach that members of false religions can be saved, or at least, when they are questioned about it. Also, when Pivarunas says: “It is evident, according to Catholic theology, that these false and immoral religions are opposed to the natural law” – it is clear that his words are ambiguous, and that they can be interpreted in different ways; for are “these false and immoral religions” only opposed to the natural law, but the believers not necessarily breaking the natural law? And in what sense are the religions opposed to the natural law? He said: “Even supposing a person were invincibly ignorant of the true Church, he must still follow the natural law to be saved (implicit baptism of desire).” So the person must follow the natural law, and then he can be saved by an implicit baptism of desire even though the religion itself is opposed the natural law? By the way, Pivarunas and his subjects have been rebuked many times by many people on this heresy, and yet, never has Pivarunas denounced any of his subjects believing in this exact heresy or demanded that they recant their heresy, nor has he or anyone else in his sect ever recanted or abjured from the fact that this heresy has been publicly taught in their public and official newsletters. It’s repeatedly been documented that almost all traditionalist priests deny the dogma Outside the Church There is No Salvation. It’s also been pointed out that almost all of these dogma deniers sometimes make statements which seem to indicate that they hold the dogma; when, in fact, they don’t. All of this is on display in Bishop Mark A. Pivarunas’ statement above. Notice that Pivarunas made statements which absolutely seemed to indicate that he holds strictly to the necessity of the Catholic Faith and Jesus Christ for salvation. Very shortly after making these statements, however, Pivarunas proceeded to deny the dogma that people “invincibly ignorant of the true Church” can be saved and thus reveal that he doesn’t believe anything he just said. Second, in citing St. Alphonsus’ opinion as if it proves his position, Pivarunas embarrasses himself. That’s because, as Most Holy Family Monastery correctly proved in the article below, St. Alphonsus’ explanation is untenable even if you accept ‘baptism of desire’ (BOD). As the article linked to above shows, St. Alphonsus’ explanation of the issue was not only riddled with errors (he cites the wrong portion of the Council of Trent), but he admits that ‘baptism of desire’ does not even provide the grace of baptism/spiritual rebirth. That’s a big problem because the Council of Trent declared that everyone must have the grace of baptism/spiritual rebirth in order to be justified. To put it another way: St. Alphonsus unwittingly admitted that ‘baptism of desire’ doesn’t provide the grace of first justification. That’s what the article proves. Yet, the truly foolish and obstinate proponents of ‘baptism of desire’ (such as Mark Pivarunas) still haven’t figured it out, even after they explained it for them. That’s precisely why defenders of BOD, who continue to promote St. Alphonsus’ opinion on the issue in the face of the facts, don’t merely contradict Catholic dogma, they make fools out of themselves. They demonstrate a complete lack of familiarity with the details of the issue, and they perpetuate a position that has been thoroughly refuted and debunked. St. Alphonsus was not infallible. His position on ‘baptism of desire’ was simply false and it must be rejected by all Catholics. Nevertheless, Pivarunas still hasn’t realized that St. Alphonsus unwittingly admitted that ‘baptism of desire’ doesn’t even justify and that his position would have to be rejected even if you accept ‘baptism of desire.’ Pivarunas’ lack of familiarity with the relevant material, combined with his inability to grasp the ramifications of his assertions, demonstrates that he’s incompetent and unequipped to deal with the fine points of these theological issues. Despite his profound ignorance and incompetence, the heretic pontificates (literally) as if he possesses some special authority, when, in reality, he is just a guy who got himself ordained and then consecrated a bishop. Mark Pivarunas denies Catholic teaching and believes that souls can be saved in false religions. He’s a heretic and a false shepherd who leads souls to Hell. He is also an apostle of birth control, a vigorous defender of Natural Family Planning. His group even endorses methods of Natural Family Planning that involve taking steps to physically alter a woman’s body chemistry to avoid conception. The article linked to below also soundly refutes Pivarunas’ argument that Natural Family Planning must be permissible because certain churchmen before Vatican II (e.g., members of the Sacred Penitentiary) allegedly approved primitive forms of it. See our article on Natural Family Planning and Objection 13 that deals with the objection brought forward by Mark. A. Pivarunas of CMRI. As a further display of his incompetence, Pivarunas also stated that St. Alphonsus taught ‘implicit desire,’ as if the saint favored the notion that people don’t need to have faith in Jesus Christ and the Trinity to be saved. No, he didn’t. As was explained in the article on his ‘baptism of desire’ error, when St. Alphonsus mentions the ‘implicit’ desire for baptism, he’s referring to people who believe in the Trinity and the Incarnation (the essential mysteries of Catholic faith), but aren’t aware of water baptism or have not expressed that desire for water baptism in words. Again, the ‘implicit desire’ to which he refers is an implicit desire for water baptism, not an implicit desire for faith in Christ. St. Alphonsus did not believe that anyone (ignorant or not) could be saved without faith in the essential mysteries of Catholicism: the Trinity and the Incarnation. However, he did wrongly think that one who believed in the Trinity and the Incarnation could be saved without water baptism by an implicit desire for water baptism. Nevertheless, BOD heretics abuse Alphonsus’ passage in which he uses the word ‘implicit’ – a passage that already contains numerous errors. They falsely assert that by ‘implicit desire’ St. Alphonsus taught the heresy of ‘implicit faith in Christ’ (which can save Jews, Muslims, etc. ), when he did not. Mark still hasn’t learned the distinction between an ‘implicit desire’ for water baptism (which requires explicit faith in Christ and the Trinity) and an implicit desire for faith in Christ (the completely heretical notion that souls can be saved in non-Christian religions, which he and his group hold). The two are not the same. Perhaps Mark is incapable of understanding the distinction. St. Alphonsus did not hold the latter, but the former. The fact that St. Alphonsus (with St. Thomas and all the saints) believed that no one could be saved without knowing the essential mysteries of the Catholic faith (and thus rejected the CMRI’s heretical position on salvation through ‘invincible ignorance’) is proven below. Here’s a very interesting new quote from St. Alphonsus which refutes the heresy that people can be saved who are ignorant of the Gospel, the Trinity and the Incarnation (the essential mysteries of the Catholic faith). This is important because many baptism of desire heretics in our day – who believe that souls can be saved in false religions and without belief in Christ – falsely assert that saints such as St. Alphonsus agreed with them. This is totally false. This is obviously not to suggest that saints, such as St. Alphonsus, were correct about everything; rather it is prove, once again, that not one saint held the heresy of “invincible ignorance,” the idea that ignorant non-Catholics can be saved in false religions or without belief in the Trinity and the Incarnation. This heresy of invincible ignorance is held by almost all people who believe in “baptism of desire” today. Here’s the quote from St. Alphonsus’ book, The History of Heresies. As we see, St. Alphonsus is clearly making reference to the teaching of St. Thomas Aquinas below, in which he denies that any soul who is ignorant of the Gospel can be saved. Rather, if there is a person who is completely ignorant of the faith but who is of good will, God will make sure that he comes to a knowledge of the faith. In the Summa Theologica, St. Thomas further taught the truth that all men above reason are bound to know the principal mysteries of Christ for salvation with no exceptions for ignorance. Here is another important quote. This important quote absolutely proves that St. Alphonsus, like all the Doctors of the Church, rejected the false idea that souls who are “invincibly ignorant” of the essential mysteries of the Catholic Faith can be saved. Notice that St. Alphonsus is explicitly discussing the concept of invincible ignorance. He is explicitly addressing the question of whether souls who are “inculpably ignorant” of Our Lord and the Trinity can be saved, AND HE DENIES IT. He affirms that only those who believe in these absolutely necessary mysteries of Catholic Faith (the Trinity and Incarnation) can be saved. This is a very important quotation because the heretical idea that souls can be saved in other religions is rampant in Traditional circles, and is taught by the SSPX, SSPV, CMRI, etc. These groups teach the false and heretical idea that explicit belief in the Trinity and the Incarnation is not necessary as a means without which no adult can be saved. Thus, as we can see, Mark Pivarunas has no idea what he’s talking about. He’s ignorant and incompetent. Yet, he presides over a group of alleged traditionalists and he pretends to possess authority to speak on behalf of the Catholic Church. Simply put, he’s a faithless individual in whom the Devil found an effective instrument to encourage birth control and corrupt belief in the necessity of Jesus Christ and the Catholic faith. Pivarunas is a heretical, non-Catholic disgrace – a false shepherd leading souls to Hell. Besides their obstinate promotion of St. Alphonsus’ false opinion, the heretical CMRI promotes other false arguments on the issue. Actually, they employ a devilish combination of lies, distortions, misquotes, half-truths and fallible arguments to deceive people and promote their false position. None of those arguments withstand scrutiny. The truth is that the Catholic Church does not teach ‘baptism of desire.’ It has never taught it, which is why the defenders of BOD must always resort to fallible documents and opinions to make their arguments. Rather, the Catholic Church infallibly teaches that there is only one baptism of water, and that no one is saved without the rebirth of water and the Spirit, as it is written in John 3:5. That’s the teaching of the Catholic Church. Anyone who tells you otherwise is not telling you the truth. The Catholic teaching on this point is proven by the quotes below. The obstinate proponents of ‘baptism of desire,’ while they think they are of safe ground promoting the position that one can be saved without the rebirth of water and the Spirit, are actually doing that which is criminal according to Catholic teaching. Their spiritual crime involves obstinately preaching contrary to the one and only dogmatic rule of faith on the matter. Consider these two dogmatic statements from The Council of Vienne on baptism as a unit. All in the Church (outside of which no one at all is saved) have one and the same baptism; and that one baptism (which all in the Church, outside of which no one at all is saved, have) is of water. About four months after the silencing of Fr. Feeney in April by Richard Cushing, the apostate “Archbishop” of Boston, the so-called Holy Office issued a document on August 8, 1949. Actually, the document was a letter addressed to Bishop Cushing, and signed by “Cardinal” Marchetti-Selvaggiani, known to most as Protocol No. 122/49. It is also called Suprema haec sacra and the Marchetti-Selvaggiani letter. It is one of the most crucial documents in regard to the modern apostasy from the faith. Protocol 122/49 was not published in the Acts of the Apostolic See (Acta Apostolicae Sedis) but in The Pilot, the news organ for the Archdiocese of Boston. 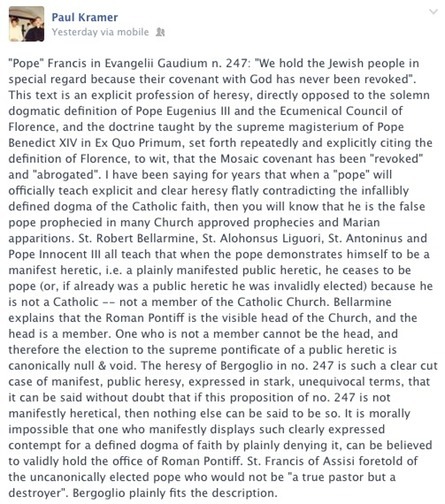 This was the impression given to almost the entire Catholic world by Protocol 122/49 – the Marchetti-Selvaggiani letter. Protocol 122/49, as the above headline bluntly said, held the “No Salvation Outside the Church Doctrine” to be false. By this fateful letter, the enemies of the dogma and the Church appeared to have been vindicated and the defenders of the dogma seemed to have been vanquished. The problem for the apparent victors, however, was that this document was nothing more than a letter from two heretical so-called cardinals of the Holy Office, who had already embraced the heresy later adopted by Vatican II, to one apostate “archbishop” in Boston. Some may be surprised that I describe “Cardinal” Ottaviani as heretical, since he is considered by many to have been orthodox. If his signature on the Protocol isn’t enough proof for his heresy, consider that he signed all of the Vatican II documents and aligned himself with the post-Vatican II revolution. In other words, according to Fenton, the teaching of Suprema haec sacra is not infallible and must be found in earlier documents; but it isn’t, as we will see. Fenton is simply wrong when he says that Suprema haec sacra is nevertheless authoritative. Suprema haec sacra is neither authoritative nor infallible, but heretical and false. Since almost the entire public was (and is) given the impression that Protocol 122/49 represented the official teaching of the Catholic Church, it constituted the selling out of Jesus Christ, His doctrine and His Church to the world, a selling out that had to take place before the wholesale apostasy of Vatican II. By Protocol 122/49 and the persecution of Fr. Feeney, the public was given the impression that the Catholic Church had now overturned a 20 centuries’ old dogma of the faith: that the Catholic Faith is definitely necessary for salvation. And even to this day, if one were to ask almost every so-called Catholic priest in the world about the dogma Outside the Catholic Church There is No Salvation, he would probably be answered with a reference to the Father Feeney controversy and Protocol 122/49, even if the priest is unable to identify or recall the specific names and dates. Try it, I know from experience. A huge amount of basically all of the Novus Ordo priests who know anything about the issue will use Protocol 122/49 and the “condemnation” of Fr. Feeney to justify their heretical, anti-Catholic, antichrist, anti-magisterial belief that men can be saved in non-Catholic religions and without the Catholic Faith. These are the fruits of the infamous Protocol 122/49. And by their fruits you shall know them (Mt. 7:16). Compare the Protocol’s attempt to explain the dogma away with Pope Gregory XVI’s treatment of the same issue in his encyclical Summo Iugiter Studio. Pope Gregory XVI does not try to to explain this dogma away, by saying, “However, this dogma must be understood in that sense in which the Church herself understands it,” as does the heretical Protocol 122/49. No, he unequivocally affirms that THIS IS INDEED THE TEACHING OF THE CATHOLIC CHURCH. Throughout the whole encyclical, Gregory XVI does not fail to repeatedly affirm the true and literal meaning of the phrase Outside the Church There is No Salvation, without qualification or exception, as it had been defined. Father Feeney and his allies in defense of the dogma were reiterating exactly what Gregory XVI officially taught above. It doesn’t take a rocket scientist to figure out that if Protocol 122/49 was written to “correct” the understanding of Father Feeney on Outside the Church There is No Salvation (which it was), then Protocol 122/49 was also “correcting” the understanding of Pope Gregory XVI and all of the infallible statements on the topic for 20 centuries. Also, notice that Pope Gregory XVI makes reference to the dogmatic definition of the Fourth Lateran Council to substantiate his position and literal understanding of the formula Outside the Church There is No Salvation. Throughout the whole document, Protocol 122/49 makes no reference to any of the dogmatic definitions on this topic. This is because Pope Gregory XVI, being a Catholic, knew that the only understanding of a dogma that exists is that which Holy Mother Church has once declared; while the authors of the Protocol, being heretics, did not believe that a dogma is to be understood exactly as it was once declared. That explains why Pope Gregory cited exactly what Holy Mother Church has once declared and the authors of the Protocol did not. If the understanding of the dogma Outside the Church There is No Salvation was not clear from the teaching of the Chair of Peter (the infallible definitions on the topic), then a 1949 letter of “Cardinal” Marchetti-Selvaggiani is certainly not going to give it to us! And if no exceptions or qualifications to this dogma were understood at the time of the definitions – nor at the time of Pope Gregory XVI – then it is impossible for exceptions to come into our understanding of the dogma after that point (e.g., in 1949), because the dogma had already been defined and taught long before. Discovery of a new understanding of the dogma in 1949 is a denial of the understanding of the dogma as it had been defined. But define new dogma is indeed what the Protocol tried to do. I continue with the Protocol. Here the Protocol begins to enter into its new explanation of the dogma Outside the Catholic Church There is No Salvation, but in a diabolically clever manner. The ambiguity lies in the fact that this statement is true: no one who, knowing the Church to have been divinely established, nevertheless refuses to submit to Her and the Roman Pontiff will be saved. But everyone reading this document is also given the clear impression by this language that some people, who have unknowingly failed to submit to the Church and the Roman Pontiff, can be saved. This is heretical and would actually make it counterproductive to convince people that the Catholic Church is divinely established! Compare the dogmatic definition of the Catholic Church with the addition to the dogma by Protocol 122/49. Here one detects another denial of the dogma as it was defined, and a departure from the understanding of the dogma that Holy Mother Church has once declared. Compare the following dogmatic definition of Pope Eugene IV with these paragraphs from Protocol 122/49, especially the underlined portions. We see that Protocol 122/49 (quoted above) is denying the necessity of incorporation into the ecclesiastici corporis, which is heresy! It was necessary to be in the Church’s “bosom and unity” (Eugene IV), but now it is “not always required to be incorporated into the Church actually as a member” (Protocol 122/49). The defined dogma of INCORPORATION and actually abiding in the ecclesiastical body (ecclesiastici corporis) has been denied. This is heresy! Everyone can know with certainty that there is a supreme spiritual being, Who is the One True God and the Creator of the world and all that it contains. Everyone knows that God is not something that they have carved out of wood or jade or stone. They know that God is not the tree that they worship or the river they worship or the rock or the snake or the sacred tree frog. They know that these things aren’t the Creator of the universe. Every such person knows that he is worshiping a creature rather than the Creator. They are, as St. Paul says in verse 20, without excuse. St. Augustine explains this well in reference to persons who died ignorant of the Faith and without baptism. All baptized infants are Catholics, even if they are baptized in a Methodist church-building, etc. This is de fide. The Catholic Church has always taught that anyone (including a layman or a non-Catholic) can validly baptize if he adheres to proper matter and form and if he has the intention of doing what the Church does. There is no way on earth that the teaching of Protocol 122/49 is compatible with the teaching of Pope Eugene IV and Pope Boniface VIII. To accept, believe or promote the Protocol is to act contrary to these definitions. Here the heresy comes out quite bluntly. People who don’t hold the Catholic Faith – who are “involved in invincible ignorance” – can also be united by “implicit” desire, as long as “a person wishes his will to be conformed to the will of God.” And I remind the reader that Protocol 122/49 was written in specific contradistinction to Fr. Feeney’s statement that all who die as non-Catholics are lost. That is to say, the Protocol was written to specifically distinguish its own teaching from Fr. Feeney’s affirmation that all who die as non-Catholics are lost, which shows that the Protocol was teaching that people who die as non-Catholics and in false religions can be saved. Thus, the Protocol’s statement above is quite obviously, and nothing other than, the heresy that one can be saved in any religion or in no religion, as long as morality is maintained. Compare the above passage from the Protocol with the following dogmatic definitions. In the process of giving its false analysis of Pope Pius XII’s encyclical Mystici Corporis, Suprema haec sacra teaches that people who “do not belong” to the Body of the Church can be saved. What’s interesting about this heretical passage in Protocol 122/49 is that even Msgr. Fenton (one of its greatest defenders) admits that one cannot say that the Soul of the Church is more extensive than the Body. Hence, to say that it is not necessary to belong to the Body, as Suprema haec sacra (the Protocol) does, is to say that it is not necessary to belong to the Church. Therefore, by its statement above, Protocol 122/49 taught the heresy that it is not necessary to belong to the Catholic Church to be saved, the very thing denounced by Pius XII. This is extremely significant, for it proves that the teaching of Suprema haec sacra – and therefore the teaching of Msgr. Joseph Clifford Fenton who defended it – is heretical. They both deny the necessity of “belonging” to the true Church in order to gain eternal salvation. The reality was that Father Feeney’s expulsion from the Jesuit Order had no validity. The men who expelled him and the clerics who were against him were automatically expelled from the Catholic Church for adhering to the heresy that those who die as non-Catholics can be saved. This is similar to the situation in the 5th century, when the Patriarch of Constantinople, Nestorius, began to preach the heresy that Mary was not the Mother of God. The faithful reacted, accused Nestorius of heresy and denounced him as a heretic who was outside the Catholic Church. And Nestorius was later condemned at the Council of Ephesus in 431. Here is what Pope St. Celestine I stated about those who had been excommunicated by Nestorius after he began to preach heresy. Pope St. Celestine authoritatively confirms the principle that a public heretic is a person with no authority to depose, excommunicate or expel. The quote is found in De Romano Pontifice, the work of St. Robert Bellarmine. This explains why all of the persecution against Father Feeney (expulsion, interdiction, etc.) had no validity, because he was right and those who were against him were wrong. He defended the dogma that there is no salvation outside the Church, while his opponents defended the heresy that there is salvation outside the Church. Things between Father Feeney and the heretics in Boston remained unchanged until September 14, 1952. At this point, Richard Cushing, the so-called Archbishop of Boston, demanded that Father Feeney retract his “interpretation” of the dogma – which means retract the dogma – and make an explicit profession of submission to the Marchetti-Selvaggiani letter (Protocol 122/49). With four witnesses, Father Feeney presented himself before Cushing. He told him that his only option was to declare the letter of Marchetti-Selvaggiani “absolutely scandalous because it was frankly heretical.” This is exactly what Pope Gregory XVI would have said about the horrible Protocol letter, as well as any Catholic. During their meeting, Fr. Feeney asked “Archbishop” Cushing if he was in agreement with the Aug. 8, 1949 letter of Marchetti-Selvaggiani. Cushing responded, “I am not a theologian. All that I know is what I am told.” This evasive and non-committal answer shows the true colors of Cushing, this heretic, false pastor and enemy of Jesus Christ. If Cushing believed that one was bound to the letter, then he should have responded without hesitation that he agreed with it. But because he didn’t want to defend the letter in any of its details, especially its denials of dogma, he responded by evading the question. This evasion prohibited Fr. Feeney from putting him on the spot and convicting him with the dogma that was being denied. Father Feeney accused Cushing of failing in his duty and left.